As 2016 slowly slides into a chain of memories, I’m happily painting my way into a New Year, hoping to make new discoveries. Returning to this watercolor begun last week has not been without its interruptions and now that I have a couple of days left before this holiday ends, I’m glad to come face-to-face with the composition, yet feel somewhat lost and out of practice. I suppose the momentum broke. I paused late into this evening to re-read a book by Hemingway that I have always loved. This passage I’ve cited is one of my favorites. The setting is Paris in the 1920s when the young Hemingway was seeking his literary “voice” and seething in self-doubt. I love this soliloquy and have claimed it as my own. Yes, I’ve done this kind of work before and I shall again. All I have to do is begin with the simple, honest strokes that I have known for decades. To me, drawing and watercoloring can be simple and direct. Upon that foundation I’ll return to form, I’m confident. I love the subject I’ve chosen this time, and am looking forward to entering through this new portal and seeing what happens when I come out the other side. I know from my own experience that when I create with any degree of strength and beauty I have had no thought of consequences. Anyone who creates for effect –to score a hit–does not know what he is missing! 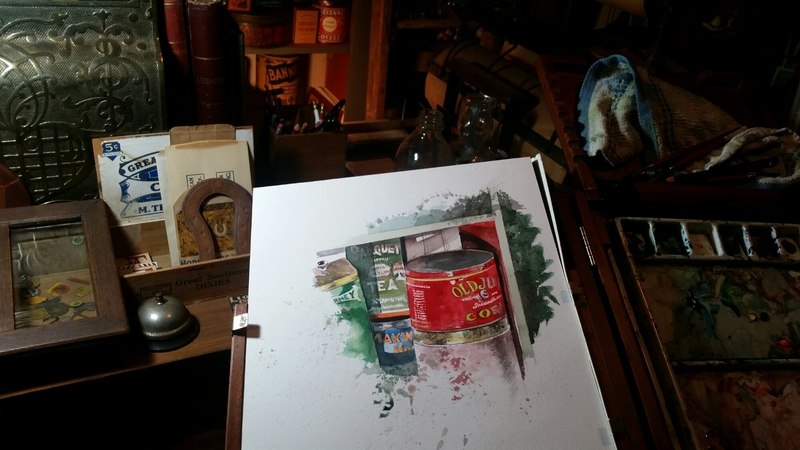 Finally, after a considerable hiatus, I am delighted to re-enter my studio. It has taken a few days to get over the weariness generated by a drive from St. Louis to Dallas/Fort Worth following my holiday visit with family. It takes me longer to hit the reset button following those long drives than when I was younger. The watercolor has gotten cold on me since I left it last week. But I have been excited to return to it, and am confident that the warmth and confidence will emerge once I give it a few strokes. I am painting this composition for my own pure pleasure, and thus the “commission pressure” is not present. And I’m not painting it with a market in mind; I just want to explore this subject that has been residing in my mind’s eye for quite a long period now. Hence, the quote from N. C. Wyeth above. I did not realize until later in life that I received far more joy and fulfilment in the making of art than in the attention or selling that followed. As my holiday draws near its close, I’m delighted, in this quiet studio, to pursue what gives me the most satisfaction. I’ll continue to post blogs as the painting runs its course. I wish all of you an exciting and promising New Year. Thanks for reading. Happy Holidays to all my treasured blog readers! I haven’t posted for over a week, as Christmas obligations and errands, along with the responsibilities of closing out the fall semester, left me with little time for communication. I did however begin work on my first new series that I am titling “Portals.” I dragged an antique door from my man cave into my living room studio so I could enjoy painting near the fireplace while listening to Christmas music this past week. As with every Chrstmas season, I leave a fresh painting-in-progress behind in my studio as I flee to St. Louis and visit with family and friends. But I always am able to return to my home free of post-holiday depression because of a painting still waiting for me that I’m excited to engage. I am re-reading an Andrew Wyeth biography that I enjoyed years ago, Richard Meryman’s Andrew Wyeth: A Secret Life. My soul stirs deeply as I read of his life and legacy, and the life and ideas of his father N. C. have taken such a hold on me that I just ordered and received (thanks Amazon!) The Wyeths, by N. C. Wyeth. That incredibly large man was so charged with literary ideas and philosophical sentiments that I cannot wait to read from the 1200 letters that he left behind, exposing his most intimate thoughts and dreams about art. So, in addition to enjoying my circle of family and friends, I’m enjoying some quality reading and times for reflection. The holidays are such a warm and intimate time for these kinds of pursuits. I wish all of you the very best of life as we sail through this season. Christmas and the New Year always fill me with the most meaningful ponderings. I blog to remind myself tha I am not alone. With one week of school remaining before Christmas holidays begin, I was delighted this morning to be seized with the inspiration to begin a new series of work I will call “Portals.” I have studied with interest Robert Motherwell’s “Open Door” series as well as the motif used in Henri Matisse. As I look toward the New Year, I’m thinking of new horizons, or new portals of discovery for artistic expression and I took some time this afternoon to research my blog through the months of October through December 2012 when I first began painting vintage doorknobs. Over past years, I have collected a number of vintage doors, doorknobs and locking plates and plan to begin a new series of watercolors on these subjects this winter. All the ones I’ve painted from the past have sold, and I’m excited at the prospect of beginning this new series. The above painting was finished over the weekend at my favorite retreat, several hours outside the Dallas/Fort Worth metroplex. Dear friends of mine own an old general store that is not in business, but still has a residence attached to it.. They have been gracious in allowing me access to this dwelling over selected weekends, and I thoroughly enjoyed my restful, quiet stay this past weekend. The door separating the storeroom from the residence was one of my subjects for study the last time I stayed there, and I managed to complete the work this time. This afternoon I took the painting to a frame shop to be custom framed and I’m excited to see how it looks when ready. Painting in the pre-dawn hours. Finishing this painting at 3:44 a.m. would lead one to think I stayed up all night. Not so. Running for several days on too little sleep finally caught up with me last night at 7:30, so I retired to bed. Surprisingly, I awoke at 1:25 a.m., and was unable to return to sleep. So I rose and began reading from the journals of Henry David Thoreau. Inspired, I returned to the front of the store, turned on the heater, and resume the watercolor I began yesterday, and was surprised to complete it within an hour. I took advantage of a weekend free of commitments and once again escaped to my favorite country retreat. The people that own this store are so gracious in allowing me turn it into a refuge when work tends to get me down. 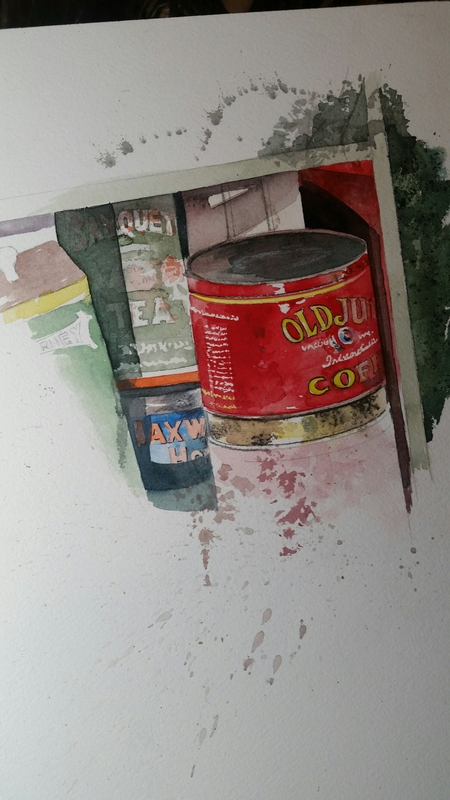 Throughout this day, I have focused my attention on a watercolor of a portion of the store’s merchandise. I am so far off the grid, that most of my attempts to publish have failed. If this “smoke signal” succeeds in getting online, then I’ll consider myself grateful and wait till I return home to post the rest of my news.